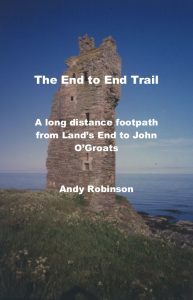 The End to End Trail, by Andy Robinson, published by Cicerone. 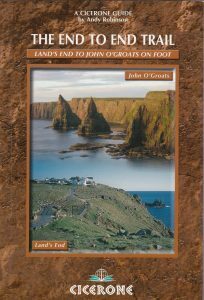 The End to End Trail is a detailed walking route from Land’s End to John O’Groats, following the hills. It’s not an official waymarked route, but the majority follows existing long distance paths. The first edition was published in 2007, and it was reprinted with minor amendments in 2014. This printing sold out in 2018, although there will still be a few copies in shops for a while yet, and it’s still available as a download. The material for a fully revised second edition is currently with Cicerone, and I hope it will hit the shops late in 2019. To tide you over until then, I’ve summarised the most important changes on some web pages you can use with the old guide. You can find them by following the links on the bar above. For the latest news, click on the “latest news” tab above. I’ll integrate the stuff in the old website at some point, but for now you can find all the old stuff here. Note that the “updates” page on the old website is not up-to-date. 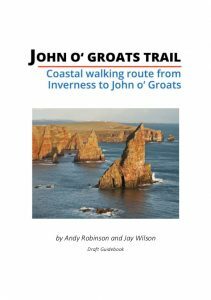 The John O’Groats Trail, by Andy Robinson and Jay Wilson. The John O’Groats Trail is a new walking route from Inverness to John O’Groats that is still under development, although you can walk it all now. It crosses the Kessock Bridge from Inverness, traverses the Black Isle and the Easter Ross peninsula, then follows the coast north. Copies of the 2018 draft guidebook are available via the Trail website, and a Cicerone edition is currently on the drawing board. Jay devised the route and is leading the effort to create the Trail. I just work on the guidebook. All material on this website is copyrighted and may not be re-used for profit, or posted online in any form without written permission. You are welcome to copy material for your own personal use.